The world on a bike: Melaka and on. As mentioned before we happened to be in Melaka on the days of the Chinese New Year. Therefore the town, at least the Chinese quarter, was overcrowded. We did the Dutch heritage walk which took us from the Stadhuys (old Dutch for town hall) and a bastion called Fort Middelburg (the name of a historic town in the south west of the Netherlands) via historic VOC-mansions and government buildings to the only city gate that's left and was built by the Portuguese even before the Dutch arrived. Then there was the Dutch graveyard and Saint Paul's cathedral on top of the hill that overlooks the town and old port. There was the gravestone of Mrs. Van Riebeek, wife of the founder of Capetown and Batavia,now Djakarta. Thrilling to see the history lessons of the fourth and fifth grade of primary school coming to live here. Other graves showed how harsh life must have been these days: many died young, in their twenties and thirties. 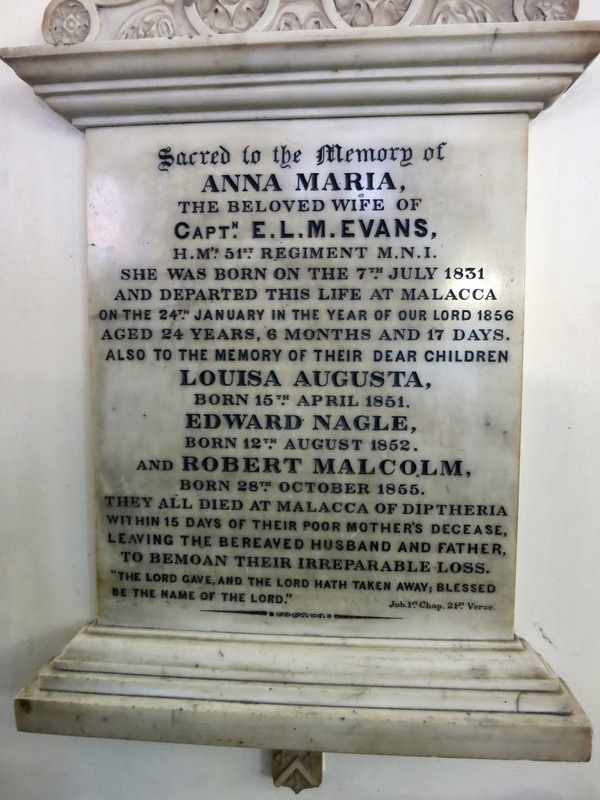 One gravestone in the cathedral referred to a mother of 24 and her four children who all died within a fortnight from diftheria, “leaving the bereaved husband and father to bemoan their irreparable loss”. This certainly quiets you down for a couple of minutes. This was all very interesting, as is the way how the local tourist industry deals with this history. On one particular street there are trishaws active, those 3-weeled bicycle-taxis. These guys are crazy. They have decorated their vehicles with the utmost kitsch-rubbish in the most akward colours. It is not funny any more, way over the top. Disneyland would fire them immediately, and you know about their good taste :-). And the real lunatics among them have mounted a loud car-audio system on their fairy vehicle. There are only very few locations where you can sit, relax and have a drink (this is Malaysia! ), and just there they constantly passed with their blaring raggea, Hindu-hymnes and Indo-China-honey-pop. I just hated them. Four days later we reached Johor Bahru (JB). This is the city on the border with Singapore. Three days along the coast, not bad riding, though the heat became a real factor. We always started early, but could not prevent riding in temperatures of 35 ˚C and more. February is already summer here, and we're almost on the equator. Hot! But as long as you ride, you're OK. There are two bridges that cross the water between Malaysia and Singapore. One is forbidden for biccycles. You can use it, but only with the bikes in a taxi or bus. The other one can be used, and we decided to do so. The roads towards JB were horrible. I mentioned the lack of planning in the infrastructure in this country. We had to ride on 6 and 8-lane motorways without a side lane for tens of kilometers. Scaring, loud, nerve-wrecking. And consider that the Warmshowershost that we were heading to in JB had figured out the most quiet and bike-friendly route, I had it in my gps. Our Warmshowers place though was a ground floor apartment in a guarded gated community with all amenities, including swimming pool and all that. A relief. And the host was not even there, we were given the keys of the house by his young cousin. I repeat: Warmshowers is awesome! The next day the ride into Singapore was totally different. As soon as we had crossed the bridge and got through customs we were on clean, wide, shady and quiet roads. A lovely ride through a hilly park like countryside to the city centre and our guesthouse in an old shophouse amidst the skyscrapers. Later we heard why roads are so quiet in the million people city: in order to be allowed to buy a car you first have to by a license to buy a car. It costs about 80.000 Singapore dollars, which is more than 46.000 Euros. Then you can go and buy a car. Did not prevent us from seeing a convoy of at least 20 Maserattis, Porsches and Ferraris roaring by the first day we were there.